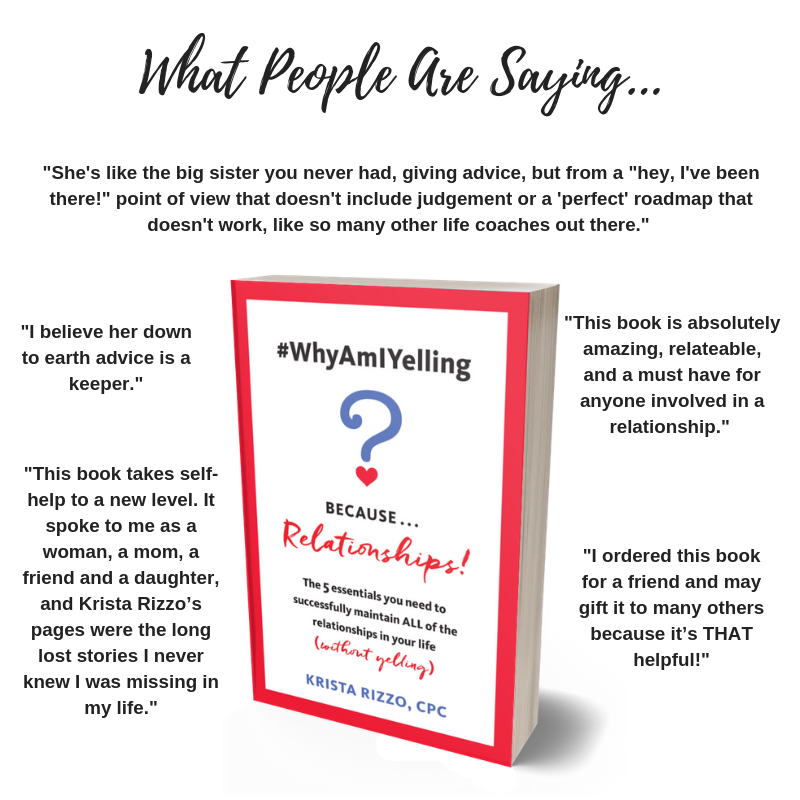 BOOK — WHY AM I YELLING? #WhyAmIYelling? Because…I Had To Write It! It’s my first book you guys!!! A few years ago I was observing my son go through some growing in his relationships that inspired me to write a few blog posts about his adolescent experience. Those posts then morphed into something bigger…My editor recently asked me a few questions that I thought would be fun to answer for you. I wrote this book because each and every one of us has questioned our relationships at some point in our lives. Sometimes we’ve struggled to make them work or forced them to be something they weren’t. Other times we celebrated them and ourselves in the process. Every emotion is important, I wanted to make sure that was highlighted. This book is unlike any other relationship book because it doesn’t focus on one specific relationship. It talks about all of them and how regardless of the relationship, they all need the same essentials to thrive. Why does this book mean so much? I realize there are a lot of options when it comes to buying and downloading books. As someone who runs a small business, my first choice is to always go through my local bookseller. I also know that convenience takes precedence in a lot of our lives so I’ve made the book available at places like Barnes & Noble and Amazon. I’ve decided to give you the choice when it comes to getting your book. Choose wisely! I Wrote The Book On Relation-Shifts! A few years ago, I found myself being pulled to write a book about relationships - but not just one specific relationship, all of them. So I decided to do some research and find a connection to write about. From there, the 5 Essentials were born. You see, even though all of our relationships are different, they all require the same essential elements to make them thrive. They’re all connected, therefore maintaining them should be easier when you take the 5 Essentials into consideration. #WhyAmIYelling? Because…Relationships! Launched in November 2018, and it’s being met with positive reviews! Download the first chapter of #WhyAmIYelling? Because…Relationships! For FREE!